Want to be a member of Oriflame? Like Akanksha in the mail below, many people who want to be a member of Oriflame look for someone who can really guide them well. Before I started Oriflame I was working in a Bank. I never sold anything to anyone. After I joined Oriflame, I learnt everyday from my upline director. I called her every now and then with questions and more questions. Then I aimed at the big goal - the level that gives you bonuses and I qualified as a Director. Actually anyone who is willing to learn can get success. I will teach you step by step if you are ready to put your time and effort. I have helped lots of women who wanted to be a member of Oriflame from various parts of India to become successful Manager, Senior Manager and Director in Oriflame. You can get in touch with me on 09820850522. 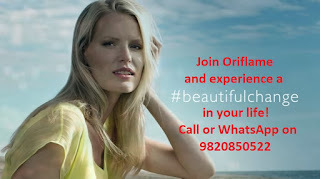 I want to be a Oriflame member but I am a typical Indian housewife stuck to her home cannot go anywhere but want to earn something so that I am not depended on anybody so please can u help me out in all this matter as I am not so much of a socilise person who interacts with people much can i be a good member and this kind of behaviour of mine earn profits.